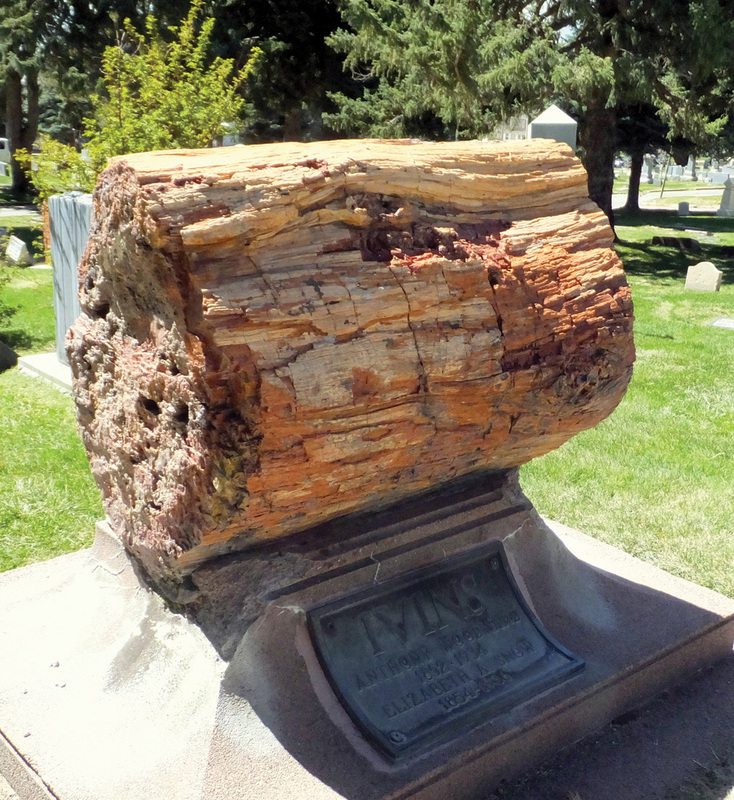 A geologically elegant monument from 1936—a sizable perched bole of petrified wood. The Salt Lake City Cemetery has the uncontested title of America’s largest municipal cemetery, covering 120 acres (not counting other adjoining cemeteries, green spaces, and parks). 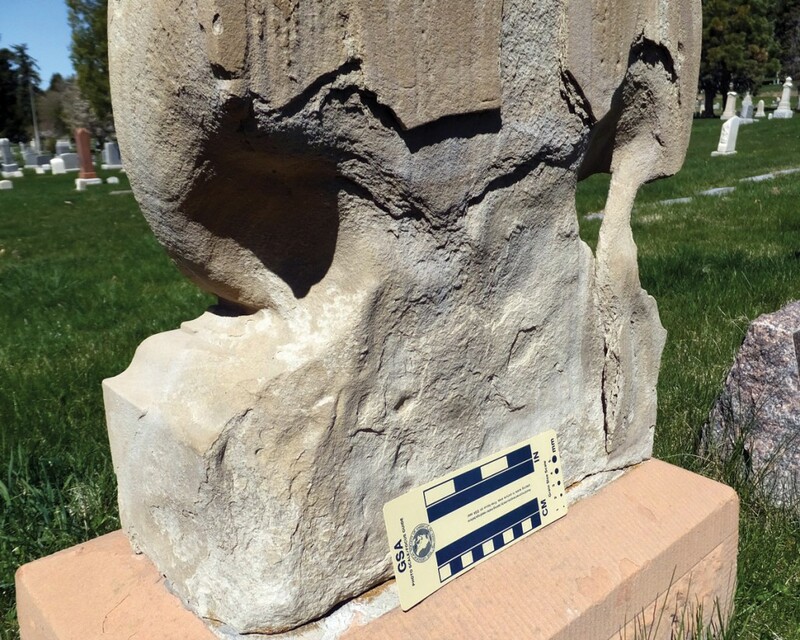 Situated on a south-facing hillside in The Avenues neighborhood 11/3 miles due east of the Utah State Capitol, Utah’s oldest enduring cemetery had its first burial just before the mid-nineteenth century, and today is a few thousand shy of reaching its full capacity of 130,000 graves. To geologists, cemeteries are rock gardens that offer an exclusive opportunity to see rock with a “manufactured on” date. The exact age of tombstone rock surfaces can be known and used to evaluate rates of weathering (the in-place breakdown of rock), types of weathering, and the effects of weathering on specific kinds of rock in particular environments. 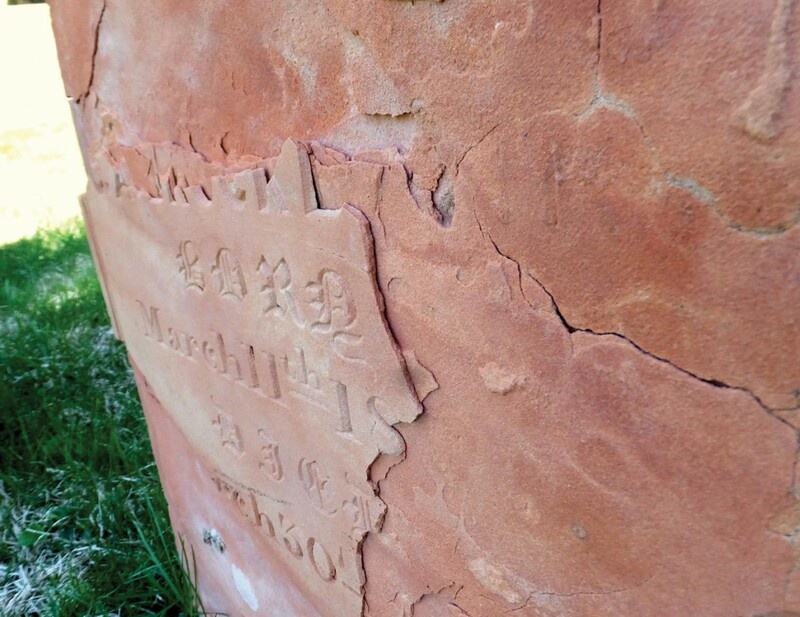 As such, a cemetery is a superb laboratory for weathering studies. By the mid-twentieth century most tombstones were carved from granite or other weather-resistant rock such as gneiss, coinciding with improved stone-cutting and polishing tools and low-cost transport. 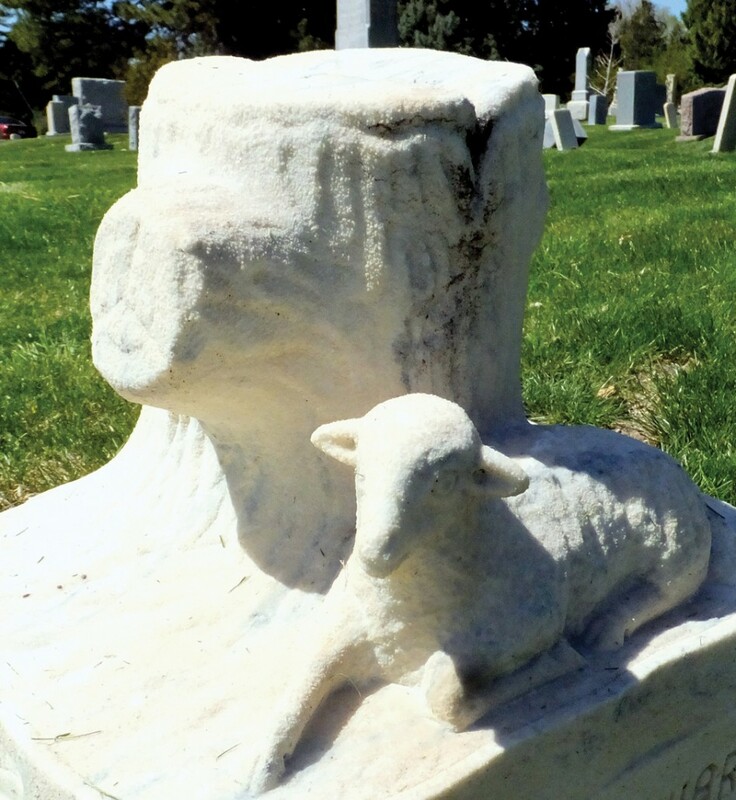 Prior to granite, fieldstones, slate (although absent in Salt Lake’s cemetery), sandstone, and marble were often used and usually quarried nearby—today stone is imported from quarries all over the world. In 1900, more than three-quarters of Utah’s dimension stone industry value was from a dozen or so sandstone quarries that shipped as far as the Pacific Coast. 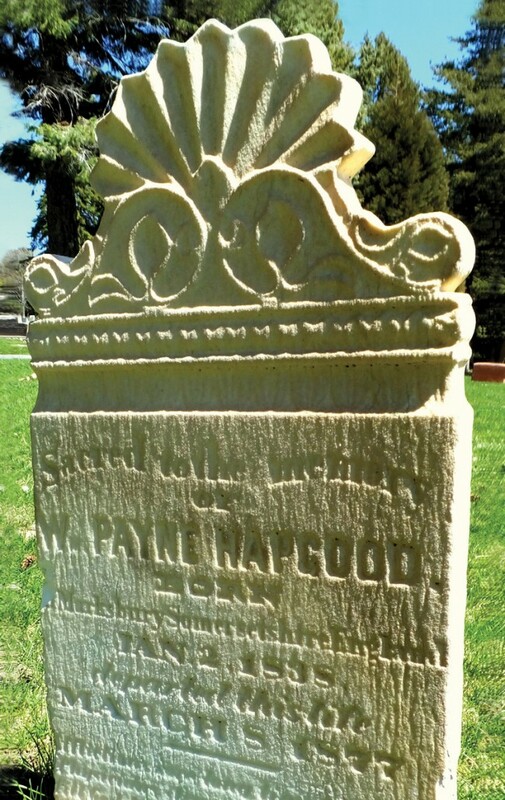 Sandstone was a popular selection for early headstones in Salt Lake because in addition to being uniform, relatively soft, and easy to extract and carve, sandstone was local and inexpensive. Rock weathering processes fall into three categories: biological, physical, and chemical. These processes can work alongside each other to enhance weathering, and particular rock types are more susceptible to particular processes. Organisms cause biological weathering—for example, lichens and mosses etching rock through organic acids or plant roots exploiting and enlarging cracks in rock. Physical weathering, such as freeze-thaw or salt crystal growth, pries rock apart. Chemical weathering preferentially attacks certain minerals through processes such as oxidation, carbonation, and hydrolysis—for example, disintegration of feldspar minerals in granite that leaves behind the more chemically resistant quartz crystals. Calcite in marble or limestone is highly susceptible to dissolution via acidic water—natural rainwater has an average pH of about 5.6 (moderately acidic) from carbonic acid, and rain in cities tends to be more acidic through the addition of sulfur dioxide and nitrogen oxide from combustion of fossil fuels. The Salt Lake City Cemetery shares in the history of one of the most notable natural disasters to strike the city. On Sunday, August 19, 1945, an extreme wind-rain-hail storm ripped through Salt Lake City at 10:30 p.m. Fifteen minutes later, there was a half-million dollars in property damage at the cemetery, Avenues neighborhood, and city airport. A 3-foot wall of water originating in Valleyview Canyon flowed across the western side of the cemetery to N Street, then jumped over to M Street. The flood tore through the cemetery, scouring flowerbeds, tearing up trees, dislodging tombstones, and carving deep gullies across plots. A second flood coming out of Perrys Hollow washed out roads and monuments in the middle of the cemetery, then broke through the boundary fence between O and P Streets, joining the flood out of Valleyview Canyon at M Street and 1st Avenue. More than 120 homes in The Avenues were affected in the 1945 cemetery flood: basements flooded, yards were ripped out, and chunks of pavement, muck, and boulders “as big as bushel baskets,” 300 to 400 pounds in weight, were deposited along South Temple in 5-foot drifts. Remarkably, there was no loss of life. 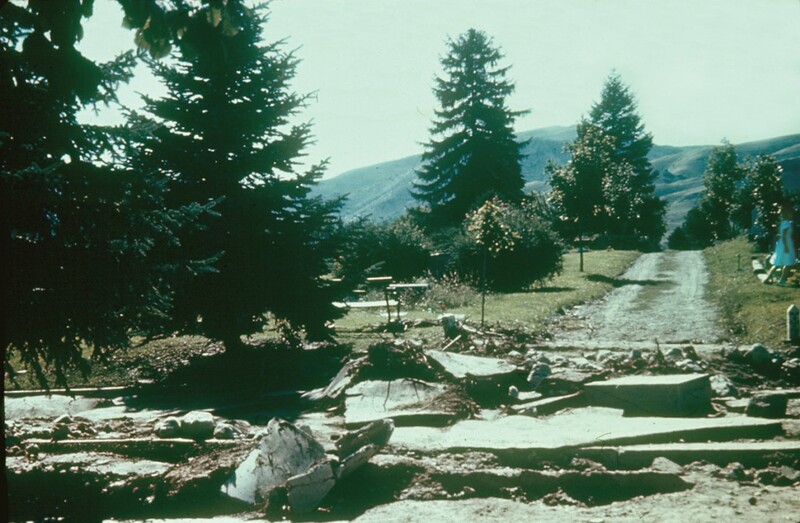 The U.S. Forest Service cited the fire in the watershed the summer before as a major factor in the flood; the 15-minute deluge quickly ran off the unvegetated slopes. Since then, lower Valleyview Canyon has been urbanized and a flood-control retention basin was constructed in 1975 at 11th Avenue Park, and a dam and catchment with drain were constructed in Perrys Hollow at Chandler Drive. Salt Lake City Cemetery is located in The Avenues neighborhood east of downtown and is bounded on the south by 4th Avenue, to the north by 11th Avenue (although a small parcel is north of 11th Avenue), on the west by M and N Streets, and on the east by U Street. Although there are several vehicle entrance points and a grid of streets within the cemetery, the main entrance is by the sexton’s house/main office at the corner of 4th Avenue and N Street. 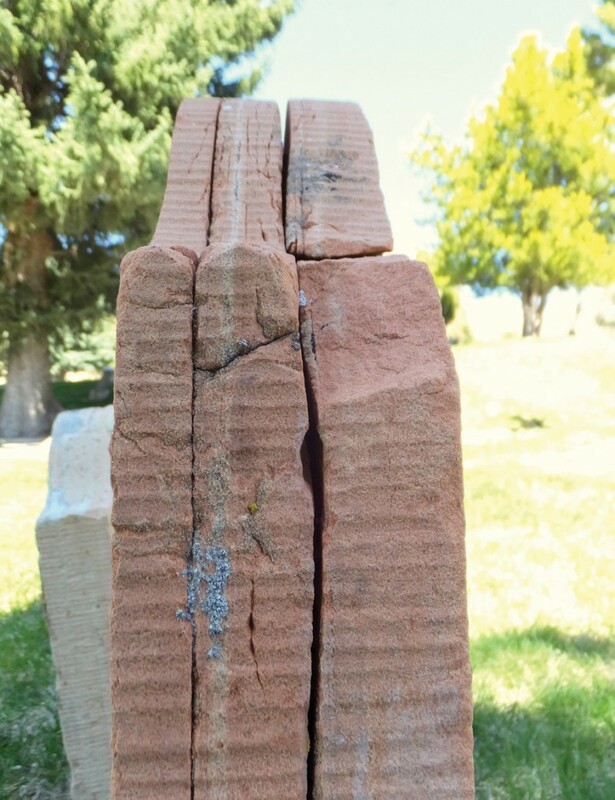 The best examples of rock weathering and the greatest variety of rock types are found in the southwest section of the cemetery. Please drive carefully as there are deep roadside drains, narrow roads, and pedestrians. Always use proper cemetery etiquette.